The Titan is a 4×4 APC (Armoured Personnel Carrier) vehicle designed and manufactured by the Company Inkas, a global leader in the manufacturing of armored vehicles based in the United Arab Emirates. The INKAS Titan APC is designed to offer a multi-role armoured vehicle offering high level of protection and comfort for the crew and troops. 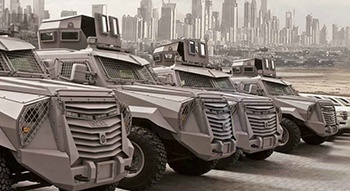 The Titan incorporates revolutionary lightweight armor which increases mobility and speed performance in comparison with other similarly-sized vehicles available on the military and security market. The TITAN APC is build on a FORD F550 Super Duty commercial truck chassis which has proven to be a highly versatile armoring platform as Inkas has developed other armored or protected vehicles solutions using the F550 chassis. The use of commercial chassis as the Ford F550 reduces the cost and lead time for spare parts as they are easily attainable through Ford’s global distribution network. The INKAS Titan APC can be fitted with a single-man open top turret mounted at the front part of the roof which can be armed with a machine gun up to 12.7mm caliber. The gunner position is protected on 360° with armoured plates including small bullet proof windows allow 360 ° observation under shielding. On request, the Titan can be also fitted with a remote weapon station that allows the gunner to operate the main weapon from inside the vehicle with a high degree of precision and under the protection of the vehicle. The INKAS Titan APC is designed to carried a total of 10 people with two individual seats in the first two rows for the driver, commander and two people at the front and six people at the rear seated on two bench seats that run along either side of the hull. Seating arrangement of the Titan can be configured on the customer requirement. The engine is located at the front of the vehicle. The front of the crew compartment is fitted with two large bullet proof windows with metal mesh guards providing additional protection to ballistic glass surfaces. Rapid entry and exit for the crew is via two forward opening doors in each side of the hull. There is one more door at the rear of the hull. In each side of the hull are three windows with individual gun port in the lower part, there is two additional gun ports at the rear of the vehicle. Standard armour of the TITAN is CEN Level B6 which provides protection against firing of small arms 7.62×51 SC ammunition, 7.62×51 M80 NATO Ball ammunition. In this configuration, the Titan has a maximum weight of 7,300 kg. The TITAN has been also tested to meet CEN Level B7 ballistic protection. The B7 level armoring can defeat armour piercing 7.62x51mm ammunition that are designed to penetrate armour whereas B6 level armoring cannot. With the B7 armour, the Titan has a weight of 8,330 kg. The Inkas Titan APC is motorized with a 6.7L V8 diesel engine 220 hp. at 2,200 rpm coupled to a 6 speed automatic transmission. The Titan APC can run at a maximum road speed of 110 km/h and 60 km/h in off-road conditions with a maximum cruising range of 1,000 km. The Inkas Titan APC can be fitted with a full range of equipment including emergency lights, police lights, siren and PA system, external video cameras, and more.